Light Flight by Jeff Prace The Bic logo permanently travels across a lighter! Instant Winner by Jeff Prace The magician not only predicts the random numbers of a lotto ticket, but also the exact pattern the spectator scratches! GUM by Jeff Prace (DVD) The two dream effects with gum are to 1) make more and 2) make it fresh again. This DVD knocks both out of the park! PERFECT for anyone looking to interact with humans in their natural habitat. Jeff Prace LIVE (DVD) Action packed using everyday objects! 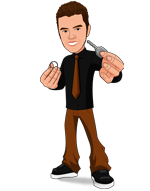 Keylicious by Jeff Prace (DVD + Gimmick) A fun, portable, easy to use, visual, gimmick to INSTANTLY switch your key and your key ring. NOW SHIPPING. HIGHLY RECOMMENDED. Silencer by Jeff Prace (DVD + Gimmick) Silence ANY smartphone at will. Jeff Prace LIVE (Instant Download) Action packed using everyday objects! SUPPORT LIVE MAGIC. DOWNLOAD THE FULL LECTURE TODAY.